I was collecting some tools from our stable (no longer used for horses) and noticed, not for the first time, a hornet buzzing about there. A careful examination confirmed my suspicion that there was a nest hiding in the corner of the ceiling. I decided that with several grandchildren due to be tromping about in there this month, disturbing a few hundred of these of these not especially aggressive, but certainly large and well-armed creatures was not to be entertained. So I confess I terminated their natural history with an insecticide. 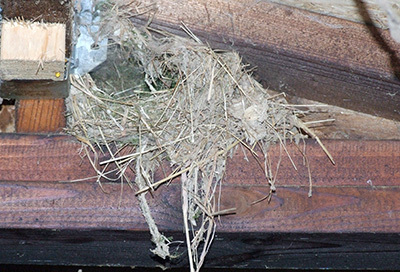 In fact the stable has been a favourite place for breeding creatures: this was the nest of a robin a couple of years ago. It’s now showing some decline from what was never the most architecturally brilliant work, though I’m sure quite adequate for purpose. The robins have scattered their nests in several places nearby over the years, sometimes ignoring the dedicated nest-box we provided, maybe because the jays and magpies know about it now. 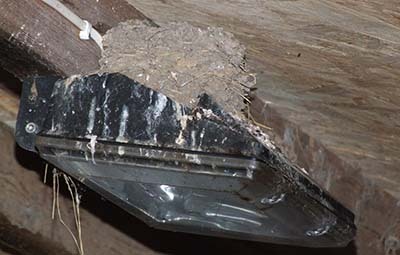 This is a rather more ambitious edifice used for the last four years or so by our swallows, which return unerringly each year from South Africa, and use one of two old nests over the stable lights. This year some of their offspring have joined them in the family business, so both nests are in use, as well as a newly-built one in our field shelter. They’ve now built up the walls so high that you can’t see the chicks within, but I assure you they are there, and being fed regularly. Neither of these compares, though, with the artistry of my (late) hornets, though, which have made papier-maché an art-form. Seeing the nest reminded me of a long passage in Darwin’s Origin of Species, in which he argues that the clever hexagonal cells of the beehive are, in fact, not so ingenious as was thought, once an evolutionary link with solitary bees is taken into account. The latter build more or less circular, individual, cells. Packing those circular cells together in a colonial hive leads to the hexagonal form quite accidentally and inevitably – the angled walls are actually akin to the spandrels over arches in cathedrals, made famous in evolutionary biology by Stephen Jay Gould as a metaphor, but deduced by Darwin literally. In concentrating on the hexagon Darwin picked the low-hanging fruit as far as “non-design” goes. The real mystery of bee-architecture is their secreting and chewing up wax and learning to use it as a building material in a way that ensures a stable environment. 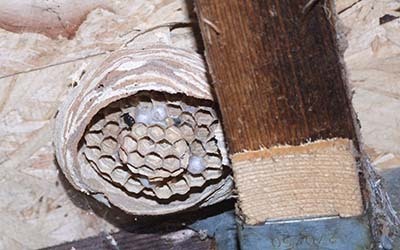 The wasps, evolving similar building techniques for their cells, have utilised a completely different material by chewing up wood with saliva (and a small amount of soil for necessary rigidity) to form paper – and by using a far more accomplished architecture in what they build than honey-bees, and accordingly a more complex set of building behaviours. In the case of the European hornet this achieves something like perfection as the photo of our half-completed nest shows. They begin by creating a firm stalk reaching downwards from their chosen anchorage point, and then building a cell on the end, and two complete rings of cells outside it. The cells are hexagonal and the developing nest quite symetrical. A spherical retaining wall is then built outside that, and further cells, up to a total of two to four hundred, are arranged within that. 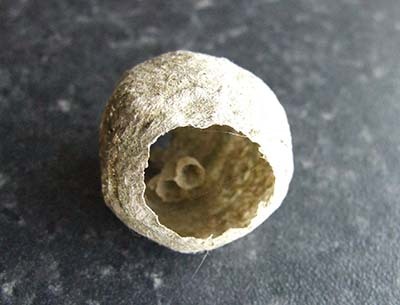 The result appears rather neater and better finished than the common wasp’s nest (though I found an early one of those , just an inch across) in a nearby outhouse yesterday, inexplicably trapped in a spider’s web, and it shared something of the hornet nest’s symmetry in miniature). The point is that this involves highly skilled work, which, as far as we know, is probably instinctive, genetically-mediated, behaviour rather than being learned from Mummy-hornet (see the parallel case of the leaf-cutting bee, which unlike the hornet and the robins and swallows does not feed and nurture its young) . That brings me back to the subject of my last column, based on an article suggesting that complex diseases and behaviours appear to involve not just a few genes, but virtually the whole genome. I pointed out that the original paper, as opposed to the Science Daily article on it, is behind a pay-wall, but Ian Thompson very kindly obtained it for me and sent it through – thanks again, Ian. I was pleased to see that I had not completely misrepresented the work, though perhaps I should have emphasised more that it referred to complex diseases like diabetes or Crohn’s disease, not denying that some uncommon illnesses, and some traits, might be coded by single genes. I was also pleased to see that the authors had, like me, speculated on the implications for evolution of this “omnigenic” approach. To this end they used the example of human height, whose genetics they have studied. They suggested that once one considers that, on the omnigenic model, height depends on the combined effects of perhaps 10,000 genes, each of which has variant alleles in the population, then there would be perhaps 100,000 separate genetic determinants of human height. If one assumes that there might be some environmental pressure towards greater, or lesser, height, then natural selection would not be acting on one gene, or even a small system of genes that might be thought of as a module. Instead, it would be tending to sort all the different combinations of thousands of alleles that contribute to height. Such a mechanism sounds plausible, though not very Mendelian – in fact, it puts one more in mind of Darwin’s fictitious “gemmules”, the units that each, he thought, provided the infinitestimal variations that led to gradual evolution. In fact, it seems to me that if you were to call each of the genes contributing minutely to height in the omnigenic model “gemmules”, you’d be closer to Darwin’s original theory than is Neodarwinism’s population genetics – not the first time some of Darwin’s long-discarded ideas have begun to be rehabilitated. But remember that the omnigenism in my last piece suggests that a large percentage of the entire genome is involved in any one complex trait. Once that is realised, life becomes a lot more complicated, because the environment has not only brought pressure to bear on human stature, but on every other human attribute, simultaneously. If nearly every gene is involved in nearly every trait, it’s simply not conceivable that adaptive natural selection on its own has the capacity and discernment to bring both human beings and chimps into existence from a common ancestor, solely because of a different set of environemental pressures. 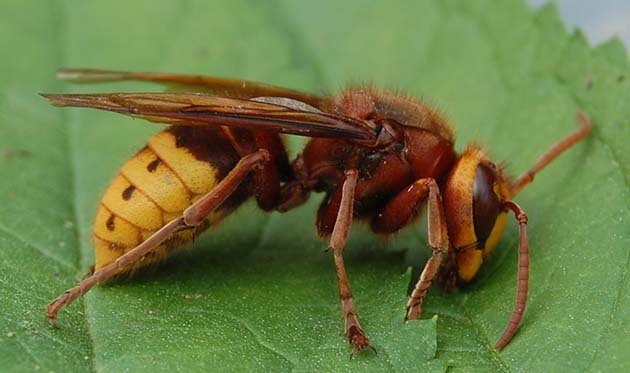 In the case of my hornets, it’s clear to see that nest-building is a complex behaviour and therefore, if mediated by genes at all, is governed by the same kind of numbers of them that mediate complex diseases or stature. But nest-architecture wasn’t the only target hornets achieved in their evolution. They too clearly benefited from being larger than the average wasp (presumably the same kind of genetic question as human height), differing greatly from them in aggression, in diet, in colour and in all the other things – such as reproductive suppression and alarm-dancing – that make them what they are. If the functions of all the genes in their genome overlap to serve these multiple functions, then natural selection must become as overloaded as Muller proposed, and as Kimura agreed in formulating neutral theory. On the other hand, whilst bees may not need much brain to make hexagons by cramming circles together, nothing about that hornet’s nest (or about hornets in general, actually) looks like it was achieved by neutral drift and mildly-deleterious mutations. It just looks like a good design.